In college I had an odd friend. She was a student athlete from Sweden who knew little to no English. I had zero friends and she was new to the campus, so we struck up an odd friendship that has lasted for a decade now. She was a soccer player; a keeper specifically. Turns out she was good, really good. She graduated around the time women’s soccer as a professional sport started to blossom in the United States. Where she was from they had a professional league with multiple tiers (Tier 1 being the highest). She played after college back home, but I wasn’t sure how serious she was about the game (college can burn you out rapidly). I’m so happy that God blessed her with this insane opportunity. Even through dark times He never ceases to amaze! What you’re telling me is I have a track session tonight, afterwards Sporting Kansas City plays, and I have no school tomorrow?!?! Lately I’ve been messing around with PhotoShop and the lovely shirt template that I have inserted into my files. Why? Not really sure outside of the fact that it’s just fun to do. Anyways, there’s this old mantra that goes something along the lines of, “If you don’t like something, don’t complain, do something about it”. Some things in my life don’t change; I still have an appreciation for women’s soccer, just because I think it’s cool, it’s a growing business, and it’s always nice to see people who bust everything they have to grow something from nothing. 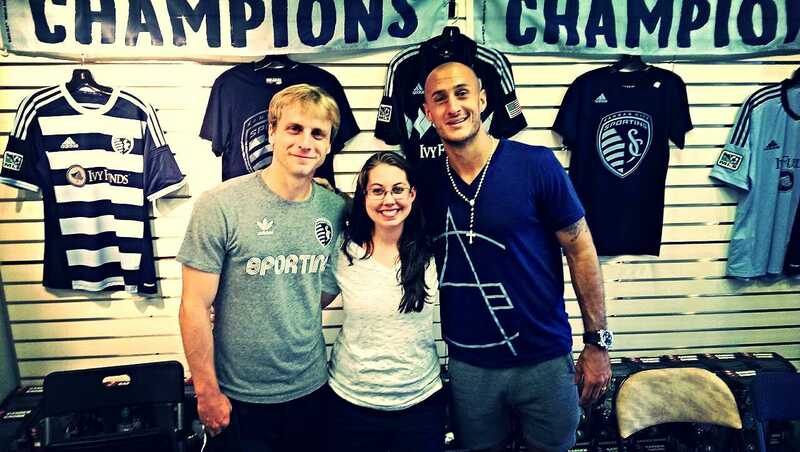 There’s a profession team in the city that I work in, along with a guy’s Major League Soccer side as well. However, so much of women’s soccer is geared towards promoting the game to, well…little girls and inspiring them to be the next Alex Morgan (by the way, please don’t). I appreciate that and all, but to be the one to complain…what about us 20-something year old men who just enjoy the game? We don’t have kids, and we don’t play the game, but we enjoy the fun aspects of the culture. Why can’t we light smoke bombs during the time goals are scored? Why can’t we enjoy some locally brewed beer before the game? Why can’t we make some odd, interesting shirts to wear during the game and beyond? I’m easily filing this under ‘pipe dream’, but I think making a random type of supporters group that doesn’t fit the exact mold would be pretty fun. Again, it’s just a pipe dream. You have to admit though, this is pretty sweet. It’s not that I’m running out of creative titles, but instead I think this one is a bit more important to be upfront. We’re heading to El Salvador, Darco and myself. We’ve made the commitment to head back into Central America this July; being led by God and tackling hard issues along the way to come to this decision. This will be the first time that Darco and I have worked together on a mission trip (and only the fourth time in my life a family member has been with me on a mission trip). This’ll also be her first time venturing outside of the United States; as you can tell from previous posts, travel isn’t really big on her list of experiences so for even a week culture shock could happen (more than likely, she’ll not want to come back to the States afterwards). We’ll leave on the second week of July, that’ll give me a few days rest from my first big race in Arizona, and will give me two weeks worth of rest before racing in Pittsburgh….a week before school starts. Needless to say, El Salvador has become the focal point of the summer, our hearts, and trying to spiritually prepare to let God do His thing, and for me to back off my overwhelming tendencies of panic, doubt, and fear. Darco has taken it a step further, she’s actually created a “Go Fund Me” page for us. You’ve got all the details right here. Would you be interested in running a soccer camp in El Salvador? How can I refuse an open door like that? P.S. If you’re interested in donating to this rather epic adventure, check out our GoFundMe page! I think this’ll most likely be the last “XO” post at http://www.filingthepapers.com. I can firmly able to say that I’m ready to see “XO” fade off into the sunset (or tragically burn in a fire…either really works). An impromptu opportunity arose today to assist a client in some marketing options late this evening. Bad news: Completely jacked our plans for Bible Study tonight. A definite sad moment. 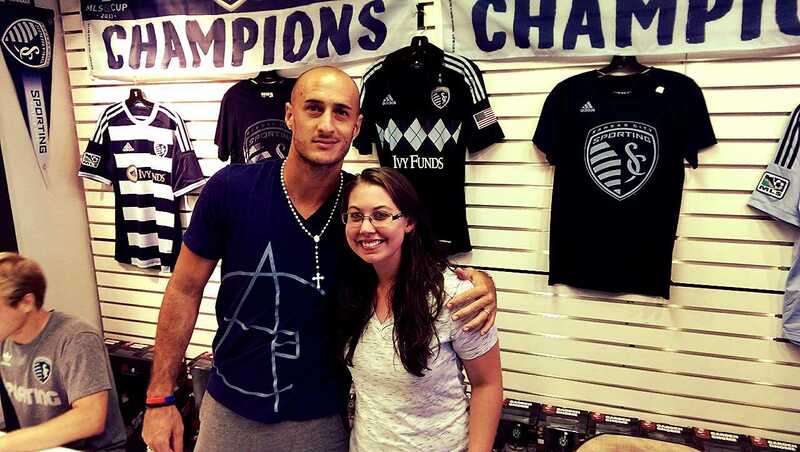 Good news: Took Darco, kind of as an initial surprise, and it turns out she was able to meet her favorite soccer player from Sporting Kansas City: Aurelien Collin. I am not the perfect husband, but I do feel so, so blessed when a job opens up an opportunity to spoil my beautiful wife.